Ethnic Georgians form about 83.8% of Georgia's current population of 4,661,473 (July 2006 est.). Other ethnic groups include Abkhazians, Armenians, Azeris, Belorussians, Bulgarians, Chechens, Estonians, Germans, Greeks, Jews, Kurds, Moldovans, Ossetians, Poles, Russians, Tatars, Turks and Ukrainians. Notably, Georgia's Jewish community is one of the oldest Jewish communities in the world. Georgia also exhibits significant linguistic diversity. Within the Kartvelian family, Georgian, Laz, Megrelian, and Svan are spoken. 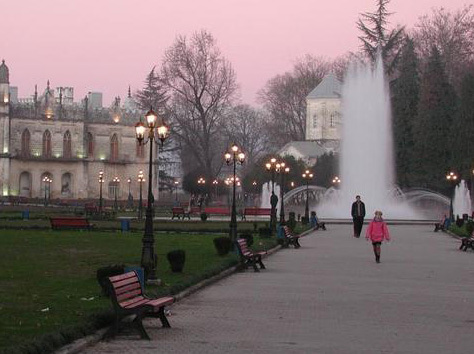 The official languages of Georgia are Georgian and also Abkhaz within the autonomous region of Abkhazia. Georgian, the country's official language, is a primary language of approximately 71% of the population, with 9% speaking Russian, 7% Armenian, 6% Azeri, and 7% other languages. In the early 1990s, following the dissolution of the Soviet Union, violent separatist conflicts broke out in the autonomous regions of Abkhazia and South Ossetia. Many Ossetians living in Georgia left the country, mainly to Russia's North Ossetia On the other hand, more than 150,000 Georgians left Abkhazia after the breakout of hostilities in 1993. Of the Meskhetian Turks who were forcibly relocated in 1944 only a tiny fraction returned to Georgia as of 2008. The 1989 census recorded 341,000 ethnic Russians, or 6.3% of the population, 52,000 Ukrainians and 100,000 Greeks in Georgia. Since 1990, 1.5 million Georgian nationals have left. At least one million immigrants from Georgia legally or illegally reside in Russia. Georgia's net migration rate is -4.54, excluding Georgian nationals who live abroad. Georgia has nonetheless been inhabited by immigrants from all over the world throughout its independence. According to 2006 statistics, Georgia gets most of its immigrants from Turkey and People's Republic of China. Today most of the population practices Eastern Orthodox Christianity with 83.9% of the population adhering to the national Georgian Orthodox Church. Religious minorities include Muslims (9.9%); Armenian Apostolic (3.9%); Roman Catholic (0.8%). 0.8% of those recorded in the 2002 census declared themselves to be adherents of other religions and 0.7% declared no religion at all.